If you want to see athletes doing insanely difficult–and sometimes dangerous–things on rock, the Reel Rock Film Tour is always a good bet. Matador talks to tour co-founder Peter Mortimer about this year’s flicks. 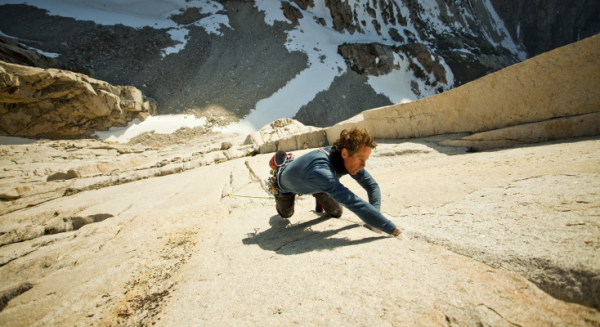 NOW IN ITS FIFTH year, the Reel Rock Film Tour has hosted the premieres of some of the most popular climbing movies ever made, among them the Emmy Award-winning King Lines. The 2010 edition kicks off in Boulder this September, and will span some 150 shows on multiple continents, with prize giveaways, appearances by guest climbers, and an amateur filmmaking competition. To get the lowdown on this year’s show, I spoke to Peter Mortimer, founder of Sender Films and co-creator, with Josh Lowell of Big UP Productions, of the tour. So the Reel Rock Film Tour is heading into its fifth year. Got anything special planned to celebrate? Nothing that ties in directly with five. Except that there’s going to be five films on the tour, I guess. I hadn’t thought about that. But no, the tour’s just been growing every year. It started with just about 40 shows five years ago, mostly around the western US. And now we’re doing over 150 shows globally, we’re doing big tours in Mexico, Austria, Australia, all across Europe. I think it’s more of a chance for us to look back and be psyched about how far it’s come. Are you personally at a lot of the stops on the tour? I only generally go to a few shows, like the big premiere here in Boulder. Actually, the premiere is September 16th, and I have a baby due on September 13th. So my job in the next two months is getting the films done. As far as the films go, there’s one thing that struck me: this is the first Reel Rock Film Tour without a feature film premiering on it. What was it that attracted you to doing short films instead of features? Another big thing was that people love shorts at theaters. Even on the Reel Rock Tour, in years past, we’ve always gotten great feedback on the short films that we’ve shown. Let’s talk about this year’s films. You’ve got “The Hardest Move”, with Daniel Woods and Paul Robinson; “Origins: The Hulk”; “Tasmanian Devils”; “Fly or Die”, with Dean Potter; and “The Swiss Machine”, with Ueli Steck and Alex Honnold. How did the work break down? Did you collaborate with other filmmakers? Well, we have a team of filmmakers. There’s Josh and I, Nick Rosen, who’s off shooting with Josh right now, and Rob Frost, who you may know, he’s done climbing films in the past. Between the four of us, we shot all of it. And we really picked our stories this year to complement each other on the tour. The Daniel and Paul stuff is just cutting-edge bouldering. These guys are doing their new V-whatevers, and there’s a bunch of other footage really getting into their head space about what it takes to be climbing at that level and pushing the grades. Then the Incredible Hulk, with Peter Croft, who’s kind of my climbing hero, and Lisa Rands. We’ve worked with Lisa for years, but we’ve never worked with Peter. They’ve been climbing together a bunch, and he’s really been mentoring her on trad climbing. We got this great chance to go up to the Hulk, where’s he’s put up four or five of the best alpine routes in America, if not the world, long, multipitch 5.12s and 5.13s, just totally aesthetic. It’s very soulful, about his relationship with the Sierra and his climbing life. He’s 53 and is still getting up at four in the morning and soloing a few pitches before breakfast. “Tasmanian Devils” was an expedition to Ausralia with a bunch of athletes, some familiar faces, some new faces. A new face would be James Pearson, this pretty badass British climber, and there’s Matt Segal, and Cedar Wright. It’s really funny, total junk show, cars breaking down, people doing totally insane things. 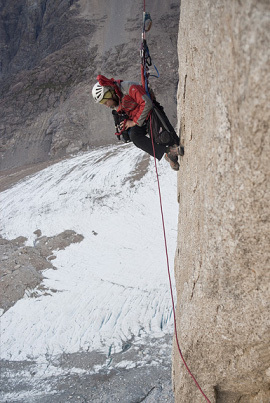 The Dean Potter stuff is a ten-minute excerpt. We did an episode for a National Geographic series, First Ascent, with Dean just doing more of his exploration, freebasing, free solo highlining and stuff. He freebased the Alien route in Yosemite after soloing the Rostrum. He also set this World Record, he did this BASE jump off the Eiger. It’ll be really cool, it’s really visual. And that’s all in the first half. The second half is more like a feature, like the Alex Honnold episode we showed last year. 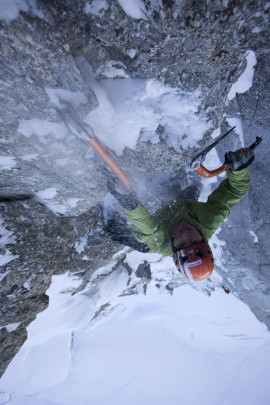 It’s on this guy Ueli Steck, who’s the most out-there alpine speed-solo madman. He’s got a little production company, and they went out and filmed him soloing the north face of the Eiger in the winter. And it’s, this footage isn’t online, it’s the craziest footage I’ve ever seen in my life. It’s so insane. They did it with a really professional helicopter with a Cineflex camera mounted on it. They just came flying in, in these really rugged conditions. Then we filmed him and Alex Honnold trying to do some speed climbing in Yosemite. It’s going to be sort of a profile on [Ueli Steck]. We feel like we’re going to be introducing him to a lot of the audience. Most people, even most core climbers, just aren’t aware how insane he is. Or even who he is. So after audiences have come and seen all these films, what will they be talking about? I think probably the Ueli stuff, because the last scene of the Ueli footage is the craziest thing I’ve ever seen. And you’ve filmed some pretty crazy stuff. Yeah, just over a year ago. And that event, I think, is a big part of why we’re having a baby now. It made us feel like we needed to do something life-affirming. In that situation, I think I’d find myself nervous to go out and work in the field. Were you feeling that when you guys were out there making the films? Definitely, especially right after. I think it goes away. I mean, it’s so complicated, with that trip. These guys were going on this expedition, and we were tagging along. Wade was really there just to shoot base camp footage. It’s not like Alex Honnold up there soloing or Dean Potter doing some crazy freeBASE thing, where you think ‘My God, someone could die here.’ Those guys were hiking up a gully that they’d hiked up three times, and an avalanche from 10,000 feet above their heads came down and hit them. So the atmosphere is different this year, I assume. I mean, this time last year was really brutal for us. We were trying to finish the series, and after that happened…I feel more distance from it now that it’s been over a year. We just had the anniversary of that whole event. I’ve just been thinking about it more in the context of the series. That footage was never intended for the tour. Where do you see the tour going in the future? Is this something you guys want to keep going indefinitely? Yeah, sure. We’ve already got a bunch of ideas for 2011. Occasionally we get inspired to do something completely wild and insane, and we always reel that back in. It has a good vibe. We’ve always wanted it to be an event where people come and get together, where you see the old dogs drinking with the gym rats. That’s always been part of the idea of the films. Read about more film tours and festivals on Matador Nights.